We only manufacture our ropes and cords out of branded high-strength raw materials, e.g. polypropylene (PP), polyester (PES), polyamide (PA.6 Perlon, PA.6.6 Nylon) in the sports and leisure fields. In the industrial sector, we also use additional fibres such as Aramid (Kevlar/Twaron/Nomex), Teflon (PTFE) or high-strength polyethylene (HMPE). Many other raw materials are available for special applications. When selecting raw materials and during processing, it is fundamental for us to tailor our ropes specifically to the respective application this achieving the highest possible quality. Naturally, we are happy to advice you in the selection of products and the development of brand new products. We produce according to our customers wishes. 6/1 or 8/1 braided ropes are the true allrounders among the braided ropes. Their simple braiding method makes them particularly long-lasting and cost-effective, yet also extremely durable. This rope design is characterised by outstanding knotting properties thanks to being slightly rougher surface texture. 8/1 braids can also be designed as square braids. Available from 0.5 – 10 mm. 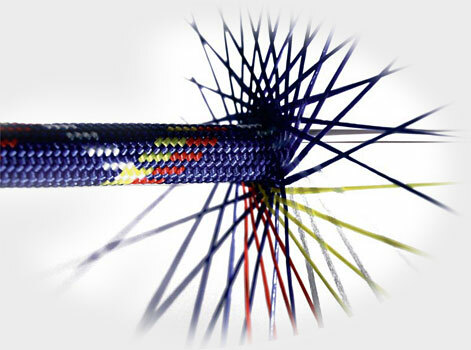 Core-sheathed ropes consist of a braided core that is covered by a sheath. This limits their extensibility to a substantial degree. Due to their 2-component design these ropes can be specifically tailored to almost any application. Regardless of whether the sheath is to protect against UV radiation or abrasion, or to reduce the friction coefficient or form the surface for impregnations: the core is protected and absorbs the majority of the load. Available from 2 – 14 mm, 16/1 – 48/2 braids. sudden impacts so that the generated forces are spread out over a large area and the cord won’t cut anything. The manufacturing process used for these cords avoids any cutting edges or selvedges that could fray or lead to injury. 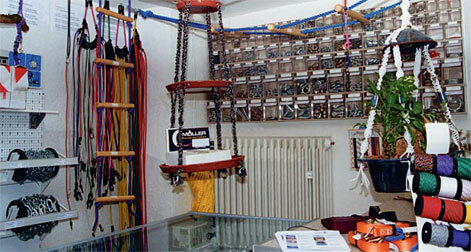 Available from a width of 8 – 25 mm, 16/1 – 48/2 braids. Spiral braided cords are extremely supple and soft, yet they retain their shape extremely well. The particular braiding method used for these cords means they are characterised by slightly higher extension properties than 8/1 braids or core-sheathed ropes. However, their tight braid structure makes them extremely resistant to ‘fibre pull-out’. The braid structure is ideally suited to applications with dynamic flexing stresses. Available from 2 – 12 mm, 12x braid. Rubber cords with an extruded natural latex core or custom rubber cores (particularly high temperature-resistance or high suppleness when cold), 1- or 2-layer braids with multi-filament sheath or mono-filament braid: we will follow your detailed specifications. Also we are highly flexible concerning maximum extensibility as well as power and extension properties and we will tailor our products to meet your precise requirements. Available from 3 – 10 mm, 16/2 braids. We can of course provide our customers with all assembly tools and an extensive range of accessories. All cords can be supplied in a wide range of colours.